Mentioned is the way you can write Retail Security CV Template. 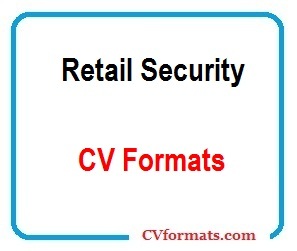 People looking for jobs can easily download these Retail Security CV formats in editable pdf and MS-Word (.doc) formats or you can just copy and paste from or website CVFormats.com and app. Cover letter of Retail Security CV Template is also available. Just change the name , address , qualification and experience and your Retail Security CV Template is ready. Effectively maintaining a safe and secure working environment for employees and customers during customer hours. Patrolling premises both internally and externally. Monitoring CCTV and responding to alarms. Tagging various items in the stores. Monitoring CCTV and assisting customers. Dealing with the general public. Trained in first aid, CPR and firearms handling. By recognizing suspicious behavior, using available surveillance systems apprehended many shop lifters and took action at the appropriate time.